The FreeMotion EPIC Hip Adduction/Abduction F809 isolates and strengthens the muscles in the inner and outer upper legs. Leg assembly can be set in one of nine start positions to accommodate a wide range of motion. The Freemotion Epic 800 line combines features like Converging Arms and Adjustable pieces for ergonomical workouts, a 1/4" cable rated to 4,200 lb Minimum Tensile Strength and Heavy guage Steel for a durable machine that can withstand your workouts, and other things like Bolt-down Straps and a convenient design that offers easy maintenance and service access into a solid singleand multi station Strength Line to help you isolate those muscles and reach the goals you work so hard at. Call 1800-875-9145 to speak with one of our fitness advisors with any questions you may have. Go to FitnessZone.com today and order your FreeMotion EPIC Hip Adduction/Abduction F809. Padded for comfort, thigh pads pivot to allow users to perform both hip adductions and abductions. Leg assembly can be set in one of nine start positions to fit a wide variety of users. Foot pegs are textured for secure placement, allowing the user to isolate the lower leg. Heavy-duty, 1/4" cable is rated to 4,200 lb. minimum tensile strength. Featuring a 155 lb. weight stack with a 5 lb. drop-down increment weight, the FreeMotion® EPIC Hip Adduction/Abduction delivers incredible versatility. 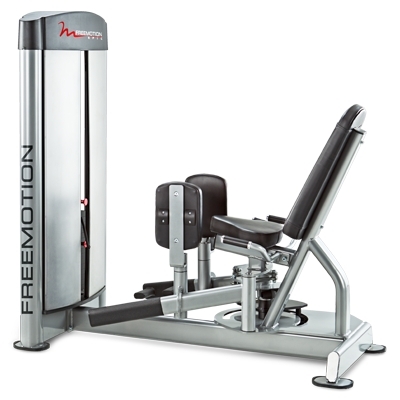 Order your FreeMotion EPIC Adduction/Abduction F809 from FitnessZone.com today!